Once upon a dreamscape, a woman discovers a giant cobra in her house. It is about 10 feet long and if she startles it, the cobra puffs up its cobra neck, hisses, and scares the bejeebers out of the woman. She loses sight of the cobra. The woman and her male companion now crouch on the top of a tall bookcase, hunched into a ball because they are close to the ceiling. They want to be sure they are as far away from the cobra as possible. Then the woman takes a peek at the bookcase shelf right under them and realizes the cobra is right there, all coiled up, too! Now what? The woman and her companion have now magically moved around the room and then around the house in and out of various rooms. Scarlet cobra is always close by and after a while, it doesn’t seem to mind us, and we don’t mind it either. We get used to each other, and Scarlet only hisses if I get too close. I marvel at Scarlet’s bright color; the red is so vivid and energized. I realize I’ve seen a bright red snake, but a boa constrictor, in my dreams before. So I realize I am in a lucid state. I’m no longer afraid of Scarlet and realize she’s not really poisonous, after all. I awaken with a feeling that something important has shifted. This dreamscape especially grabbed my attention because I was aware that I was dreaming and in a lucid state. I only occasionally have lucid dreams, so I definitely pay attention when I do. Within the dream, I remembered encountering scarlet boas before, but the only places were within past dreams. And having previously explored and created art based on those earlier dreams, I have an idea what this colorful character means – for me. Some examples and art inspired by those previous dreams are Transformation of a Scarlet Boa. Curiously, when I’ve shared this dream with others, they’ve responded generally in two ways. If they have a fear of snakes, they react by stepping back and saying how much snakes scare them. Others are fascinated by snakes, leading them to take a very close look. Both can lead to lively conversations! While researching this topic, I came across, “Snake Dreams and their Hidden Meanings,” by author Amy E. Brucker on The Dream Tribe. In it, Ms. Brucker explores various snake imagery throughout history. I was intrigued further by her focus on the healing aspects of the snake. So in this episode in my scarlet snake dream series, I had a healthy fear of its danger. But, somehow, I also learned to live with this it in my space. When I shift my perception from fear to healing, the dream takes on a whole new feeling and ah-ha! Perhaps in my own shift, my companion learns to live with the healing snake energy, too. This is an intriguing question with as many different answers as there are people. There are so many things to be afraid of… being terribly sick, having a horrible accident, losing someone close, being in the wrong place at the wrong time, etc. We each have our own fears to face. And how can we go about shedding fear? From the Cut, here are Quotes from 25 Famous Women on Fear, and overcoming it. Very inspirational! One of my favorite quotes by author Marianne Williamson, in “A Return to Love: Reflections on the Principles of “A Course in Miracles” (1992). I’ve also seen this quote mistakenly attributed to Nelson Mandela. Our deepest fear is not that we are inadequate. Our deepest fear is that we are powerful beyond measure. It is our light, not our darkness that most frightens us. We ask ourselves, Who am I to be brilliant, gorgeous, talented, and fabulous? Actually, who are you not to be? You are a child of God. Your playing small does not serve the world. There is nothing enlightened about shrinking so that other people will not feel insecure around you. We are all meant to shine, as children do. We were born to make manifest the glory of God that is within us. It is not just in some of us; it is in everyone and as we let our own light shine, we unconsciously give others permission to do the same. As we are liberated from our own fear, our presence automatically liberates others. And here’s a fun take on snakes – Bela Fleck’s Snakes Alive musical creation. 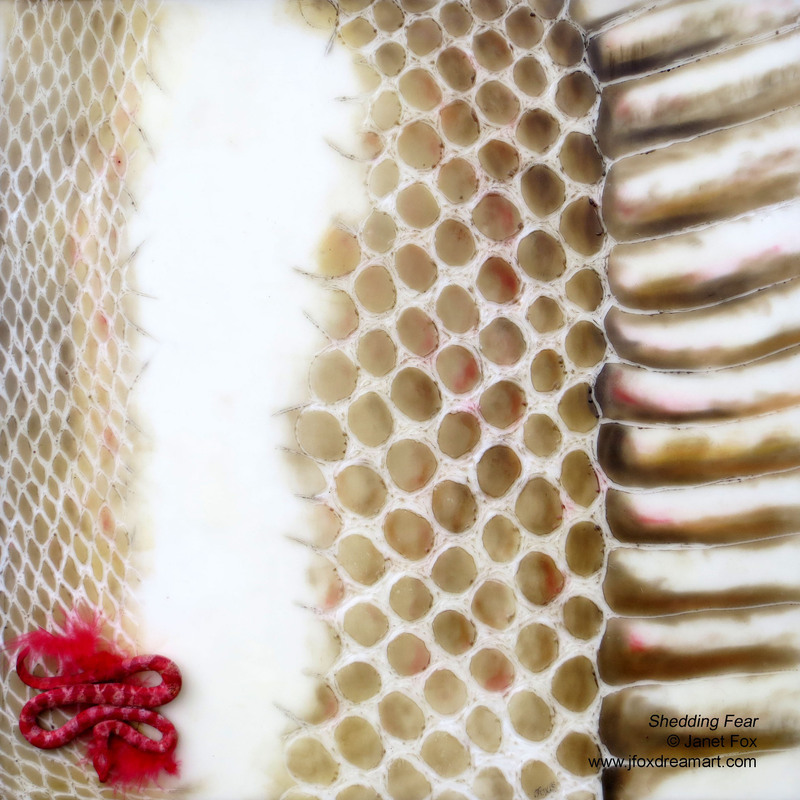 This 15″ x 15″ encaustic art piece is also inspired by an actual snake skin, one that I found in my garden compost bin. I assume the snake that molted was either hiding really well or long gone. Looking at this snake skin up close, it was very thin and fragile. With rectangular, oblong, and smaller oval segments, I marveled at its construction and form. The head portion had space for the snake’s eyes and mouth. I had to hold it very carefully, very gingerly. Which also got me to thinking about fear. Could fear be thin and fragile, too? If I could just let it go, would it shrivel up and crumble? Next, after creating the main painting of the shed skin up close, I created the miniature snake from paper clay, then painted it to resemble a Scarlet Boa, but with a bit more red. Then to finish it, the miniature Scarlet Boa needed to be resting on, wait for it… a bright red feather from a fluffy scarlet feather boa! ⇒ For information about viewing or purchasing this or related artwork, contact Janet Fox. Check out my Encaustic Portfolio for several smaller companion pieces.